I have a very live-and-let-live approach to my hygiene. I agree to not bludgeon my body’s natural cleaning processes into submission with the use of synthetic commercial products, and in exchange, my body stays clean and socially acceptable with just a tiny amount of work on my part. I grew up with a very mainstream approach to hygiene: daily bathing; store-bought chemical-based soap and shampoo; shaving and scenting and masking; compulsive checking, picking, sniffing, and scrubbing; self-consciousness to the extent of paranoia about the social acceptance of my cleanliness; the whole slam. Allow me to tell you the story of how this changed, how I let it all go, and what I learned in the process. It all started when I stopped shaving. 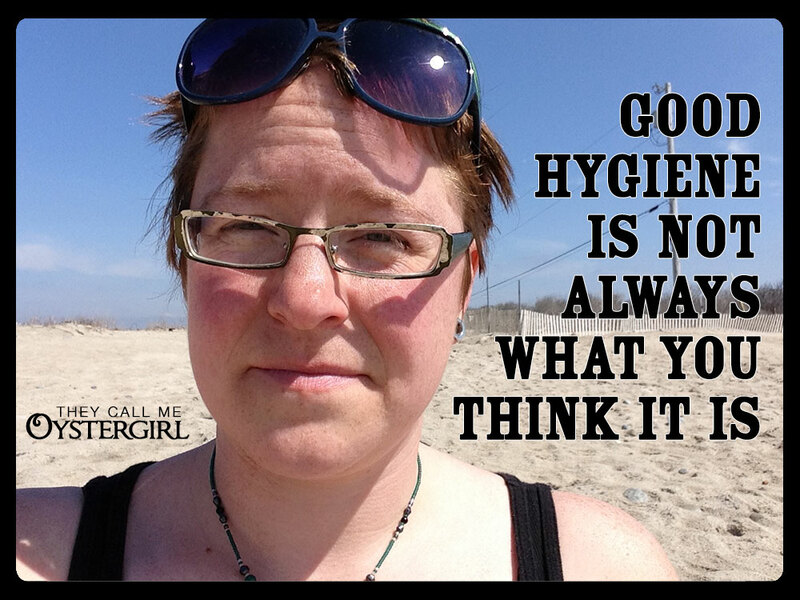 There is one clear memory I have that triggered my thinking about a more “natural” approach to hygiene. In 2001, when I was 20, I visited the radical Antioch College. There I saw, for the first time, women with unshaven underarms. It inspired me to stop shaving, to see what would happen. I let my underarm hair grow, and it wasn’t so bad. It was so much easier to NOT shave. Especially those sensitive areas. Because I am a meticulous person with a horrible short-term memory, I’ve developed cheats to help me remember stuff. One such cheat was, when I was running out of deodorant, I would not wear it that day; I would therefore smell myself and remember to buy it while I was out. The first time I did this, after not having shaved for a while, the cheat didn’t work, because I DIDN’T STINK! Not shaving made me less stinky. It was amazing. I didn’t remember to buy deodorant for 3 days! That was my turning point, in beginning to realize how so much of hygiene propaganda was just that: propaganda. I did a lot of research online. I learned a lot of fascinating things: the history of women shaving—it didn’t really take off in this country until this ad ran in Harper’s Bazaar in 1915. Potential health risks, like women shaving their underarms and using antiperspirant having a higher rate of breast cancer. My experience of being less stinky was validated. This all tied in with other awakenings of mine that happened during the same years, a real breaking-free of the restraints of my upbringing: the mainstream ideals into which I was raised, and the insecurities and self-consciousness they instilled in me. This breaking free made me feel wonderfully optimistic, and angry as hell. In 2002, I entered Antioch College (the aforementioned radical school, affectionately known as “boot camp for the revolution”), primed for its teachings. I was not disappointed. It took me a while to learn the rest of it. I was still using mainstream, synthetic shampoo and soap. (This was partly due to cost; it didn’t occur to me to get “natural” products and use them less often.) I showered regularly—mostly daily. I loved (and still love) hot showers. First it was natural deodorant, which I could allow myself to experiment with, now that I was less stinky. I started using that mineral salt stick (I still do), and I learned to appreciate how I smelled. It was an indicator of what I’d been doing, where my health was. And at Antioch, nobody complained. I could smell them, too, and it got less and less offensive to my nose. I began to move from one olfactory world to another (to paraphrase LittleOwlCrunchyMomma in this must-read post, “What’s That Smell?”). We are destroying our pheromones. I learned that our natural, unadulterated scents are pheromones: our body’s natural substances to attract. When we are healthy, inside and out, our pheromones work quite well. It’s a different sensation than smelling someone who smells like peaches and flowers and thinking that’s nice. It’s a raw, animal, primal lust kind of thing. I’ve experienced it. It’s powerful, and a little scary, because we’re not used to it. It’s also incredibly hot, much hotter than any cologne or perfume or bubble bath. At the risk of sounding like the anti-capitalist conspiracy theorist that I totally am, I wonder if part of our culture’s obsession with synthetic-smelling bodies is a way to hinder that natural pheromone release. It is NOT controllable by the media; it’s not subject to be marketed to with products. Because it happens totally on its own, there isn’t anything to convince us that we need to strive to attain. On the other hand, if we’re told that women want men who smell like Axe, that men want women who smell like—well, pretty much like anything other than what a woman smells like… If we’re all raised to cover our natural scent to the point that the natural scent of others is offensive to our adapted noses… that can be totally commodified. …and that concludes part one! 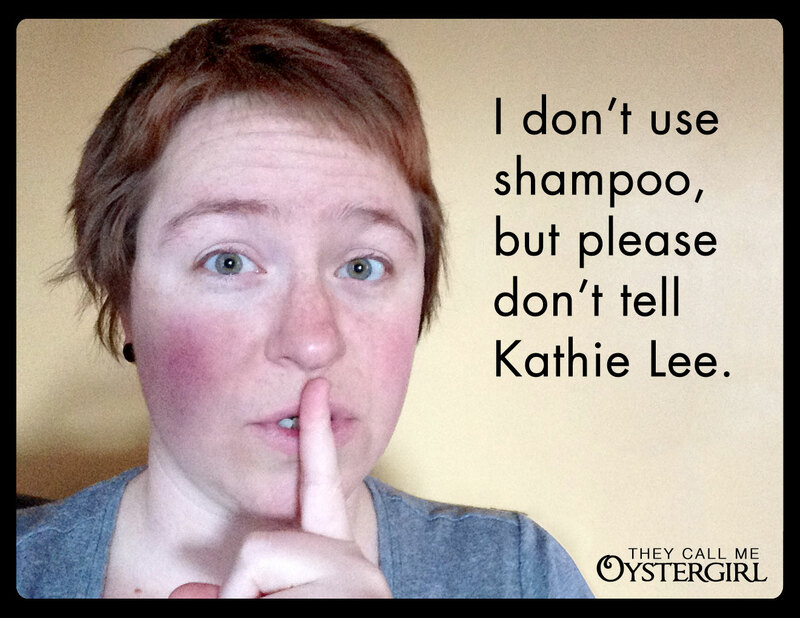 You can now read the next part of my hygiene story, which involves confronting the tyranny of soap and shampoo! ^^ graphic inspired It Takes Times’ response to Kathie Lee and Hoda’s “review” of LittleOwlCrunchyMama’s post, “Haven’t Washed My Hair For Three Years”. I love these posts!! My husband and I have used the no poo method for years now, but like you, go days without doing either- we don’t keep track and use it when we feel the need. Even now being pregnant, I can go days without ‘washing’ my hair. It’s great! About a year ago, I also decided to take the plunge and stop shaving- everywhere. I figured that the hair was put there for a reason, so why not let my body work the way it was intended! I have become so much more comfortable with my body and it’s an amazing feeling! I will now use coconut oil with a touch of baking soda if needed for my deodorant. It’s such a liberating feeling to not feel like I ‘have’ to do these things anymore! And to not need to?- simply wonderful.